Hey Buddy, I don't care if you crucify Steven Furtick but leave my Pastor alone. 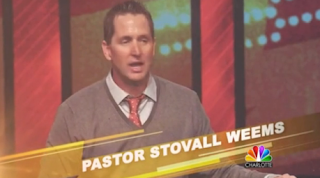 Pastor Stovall would never do anything for the sake of money. I can guarantee you that he holds Pastor Steven's feet to the fire and does not do anything immoral or unethical. Pastor Stovall has a heart for God and does not preach for money. He has impeccable character and would preach for free if someone wanted him too. go bark up another tree, somebody must have spiked your dog food. Hey Bill Rogers, to quote your own church leaders... "It's ALL about the Benjamins!" I've been following the whole Stephen Furtick "it's not that great of a house" debacle online, everybody remotely interested in spirituality from The Wartburg Watch to The Friendly Atheist has been talking about it. What I found a little odd watching the coverage has been the odd names and nicknames of some of these ministers, like Stephen Furtick's good friend "Chunks", and this minister here, Stovall Weems. I mean, seriously, if you last name is something odd like "Weems", you would think his parents would be gracious enough to give him a more common first name. Is this unique to the southeast? There are none who are so blind as those who will not see. Is Furtick wearing women's makeup in this picture? Bill slow down and be careful brother ..." He would preach for free if someone wanted him too...". You dont even realize what a great example of the problem you are. IE following pastor/rockstars. We all will be waiting your update! "Is Furtick wearing women's makeup in this picture?" 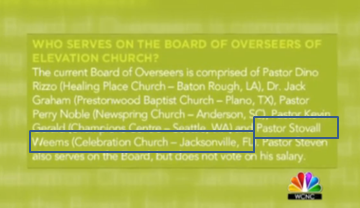 I find it interesting that they say they gave over $10m to organizations outside of the church. Why? What's the point of giving to a church that gives the money away? Obviously they have way too much money and don't know what to do with it. And, for the record, a church giving money away doesn't absolve the pastor from fleecing the same congregation and brow-beating them on the doctrine of tithing that ended with the new covenant. When all is said and done, more will be said than done! Sadly, these reports will only show those crying against it what they already know while many young preachers will continue to learn how he did it and repeat it. Remember - there is one secret now one shares: the experts they hire to happen publicity and how to turn bad to good. In the end, his church will grow and more people will buy his books. Deep down attendees envy what he has and want to satisfy their own greed. Makes them feel good when the pastor is cool with the type of unethical business deals they are doing. Does anyone know if Furtick sets any salaries of the guys on his board? i am from Jax and now reside in Chalotte and attend Elevation church. Let me preface by saying I am not one who turns a blind eye to corruption in ministries because I know it exist. But, I whole heartedly feel that that is not the case at Elevation. I have been to ministries where all they do is talk about giving money, and form a $1000 line, and God is going to bless you if you give this, and we are raising money for this or that; you always feel like they are asking for a handout. That is not the case at Elevation. I feel that this ministry has grown due to the work of God as well as the heart of the ministry which is giving back to the community. They volunteer time, money and resources ALL the time. You dont have to be a Christian to know about seed time and harvest or reaping what you sow; they have sown a lot therefore they are reaping. As an example they just gave $5000 to a local charity and $60,000 to another; no special collection was asked for during service either. A million dollar house is really not a big deal but people make it such a big deal just because its a pastor, what size house is ok $100k,$500k... in Charlotte thats not much of a house. So I said all of that to say this, i believe pastor Steven has a good heart and isn't greedy or taking peoples money to live a lavish lifestyle because I just dont get that from him. And trust me I am no brainwashed individual becaue threre are other mega churchs that I have visited and felt their focus/heart may have gotten side tracked from what ministry is about and have become about making money but I honestly dont feel that is what is happening here. Before people are quick to just jump on the bandwagon and think someting negative first review Charlotte and see house here are big and 5-9k square feet is not this huge compound that people are making it out to be; heck the house in the front of my subdivision is 5k square feet and is over half a million dollars. This story is being made out to be something when it really shouldn't be SMH. Anonymous said: "$500k... in Charlotte that's not much of a house." In Charlotte? Anyone willing to bet that most members of Furtick's congregation do not live in houses worth anywhere near that amount? Anonymous above: "[I] believe pastor Steven has a good heart and isn't greedy or taking peoples money to live a lavish lifestyle because I just dont get that from him. And trust me..."
Pastor Steve-O Furtick (indirect reference to Steve-O from the MTV series Jackass) of Elevation was quoted is this article on the worst mistakes you can make in your 20s (see point #6 of article). 6. Trying to keep up with the Joneses. New York Times best-selling author Steven Furtick once said, "The reason we struggle with insecurity is because we compare our behind-the-scenes with everyone else's highlight reel." It's easy to feel financially insecure in today's social media landscape, where every major purchase is announced on Facebook and photos from expensive vacations are shared on Instagram. Don't get lured into that spending frenzy. Your real friends will not care about what kind of cars you drive or whether you have the latest gadget. Figure out your priorities, and don't let other people dictate your financial future. I guess buying a 16,000 sq. ft. house is OK when you’re a 33 year old _________ ( insert any name of a for profit prophet) wannabe, trying to keep up with the Pastor Joneses (not intended to be a direct reference to Jim Jones but it does work in this case) and build a mansion greater than or equal to his fellow mega church cronies. I don’t make this stuff up, I just find it!!!!!!!!!!! Enjoy and distribute as needed. Shame on you. Your passion for dragging others down is revolting. Perhaps the way YOU act and what you spend your personal time devoting yourself to is what might possibly make you part of a dying and thirsty church. I am appalled at your jealousy and envy. Perhaps you should consider spending your research time planning a ,issuing for people who are needy instead of trying to pull the good down. Or, perhaps you should take one simple business course...and oldie but goodie, SUPPLY AND DEMAND. The demand goes up when you provide good service. Just satyin'. You are focusing your energy in the wrong direction, my friend. Go to a quiet place, lean in, fast, get to know Jesus, and I am sure when you are healed you will realize that there is a much healthier and more important item you can be blogging about. Place the envy aside, close this ridiculous blog and start living a GOD FIRST LIFE!!!!!!! So what he lives in 900k home. So do a lot of other people. Why do we care so much when it happens to be a pastor? You are a sheep. Stovall Weems is one of the biggest money-grubbing, unqualified "preachers" around. His million dollar mansion does not reflect the humility of a true preacher. His lack of education makes it worse. Totally Agree. Greed was named as "deadly" thousands of years ago... and has not changed. "The Love of money Is The Root of All Evil!" Funny. That's exactly what a man named Jesus Christ once said. What a load of crap. You complain that these pastors are earning "baseball money" but dont carry on about baseball or nfl salary. These pastors are sharing the Gospel and saving people, not just playing a sport, yet you complain about them??? Nobody is every forced to give their money, its a choice. These are 2 of the better preachers around. Maybe you should listen to their message instead of worrying about their salary! The load of crap is what these guys are dishing out and you're happily eating. They aren't saving people. They are con artists. I'll agree, they are 2 of the better ones around - better at getting people to fork over large sums of money and better at getting rich of their efforts.